Thinking of selling? See how Colorado Flat Fee Realty can save you thousands! At Colorado Flat Fee Realty, our mission is to bring down the high cost of selling a home and pass those savings back to you. We do that by charging a flat fee of as low as $1,500 to sell your home. That flat fee includes all the services of a traditional agent, starting with an in-home consultation, professional photography, yard signs, lock boxes, scheduling showings. On top of that, your home is listed on the MLS, which pushes your home onto thousands of websites including Zillow, Trulia, and Realtor.com. With over 92% of home buyers searching for homes on the internet, online exposure is critical to attracting buyers. But our services don’t stop there. Our team stays with you, helping you understand inspections, contracts, negotiating offers and closing. A traditional listing agent would typically charge you a 3% commission for all those services, see our fee schedule. On a $400,000 home sale, that adds up to $12,000! At Colorado Flat Fee Realty, we offer the same service for only $3,500. That’s $8,500 in savings, keeping your equity where it belongs; in your pocket! At Colorado Flat Fee Realty, we’re changing the way homes are sold! You benefit from easy & convenient E-signing capability. You have us at your side handling every detail including accompanying you to the closing. Get a Free market report of your home. Flat Fee - on a $400k home sale. 3% Commission on a 400k home sale. On average, and you do all of the work. (On Average) You do all of the work. Selling a home can be a very trying time and I want to thank the team for making our experience seamless. John is a true professional and his knowledge of the business is invaluable. Not only did he sell our property in 3 days he also saved us over $3000.00. I highly recommend Arapahoe Properties and look forward to doing more business with John & his team in the future. Just wanted to say thanks for the best real estate experience I ever had! In my experience there are very few "professionals" in your industry. I have to mention your revolutionary pricing model. You saved me THOUSANDS of dollars with your flat fee commission. This model should become the new standard and kudos to you for being a pioneer. 1. Understanding the contract and ALL the terms and provisions therein. 2. Speeding through the negotiation process. 4. Listening to your customer and “going along” with my decisions. 5. Helping me through the objection resolution process quickly and efficiently. 6. Responsiveness to my calls and emails. Notwithstanding the above, I have to mention your revolutionary pricing model. You saved me THOUSANDS of dollars with your flat fee commission.This model should become the new standard and kudos to you for being a pioneer. Colorado Flat Fee Realty, Inc. listed and sold our house for us this last fall for full asking price. 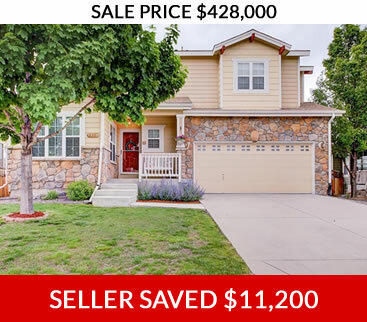 We talked to two other agents, charging full commission, and both wanted to list our house for close to 50K less than Colorado Flat Fee Realty, Inc. Not only did we make more money on our house, we also saved close to 10 thousand dollars in commissions by using them. With the hot market, the house sold for full price with a contract on the place in three days. We have been extremely happy with the work they have done and the responsiveness. Looking back on the process of hiring Colorado Flat Fee Realty a few months ago, we really did hit the jackpot. Overall the experience was as good as it possibly could have been. We were in danger of signing up a “friend” as the agent for a house we were getting ready to sell. That agent recommended $275K as a sell price, where when we spoke with John, you recommended a number $45K higher. Especially as the Mother-in-law apartment was a great asset to the property. Also, that agent said that the “Fall” time period, was a bad time to sell, and maybe we should get renters until the following summer. That same agent had also discussed putting some more money into the landscaping to help it sell. Where you said it looked good and the house should sell as-is. Two or three days later we signed a contract with Colorado Flat Fee Realty, you then had it on the market a few days after that. We had a solid contract in 3 days, with a bonus of $3,000 above asking price. With your Flat Fee saving, you were savings us another $10K in commissions. So we are at least $60,000 better by doing business with you. That is the money people hope to get after holding on to a home for many years. We shouldn’t forget, Sue helped us find a new house, and we are thrilled with that experience. Once again, we were going to offer $525K, you recommended $490K, we closed for $509K. We figure you saved us another $15K or more. So that’s what I mean by hitting the jackpot, $75,000 ahead. Of course we’ll be a reference for you any time you give our name out. Later we thought about how you had said you were a full service company, and I can tell you from the purchase and sale of a dozen other houses in the past, that you were as good or better on the service side, and will be our recommendation any time someone asks. To Anyone Listing or Buying a Home, "It is with pleasure and gratitude that we share comments on our experience in the listing and sale of our home. While we have bought and sold a number of houses, we have never before encountered such a level of excellence, along with the savings of over $14,500 in realtor commissions. Our home sold in just over a month! John educated us on the flat rate realtor experience. Explaining how there was no need for wasting such huge amounts on commissions when advertising on the MLS is what sells the home. Each phase of the sales effort was superior, such as innovative efforts in pricing our home, educating us on the escrow amount that needed to be put down, useful insights on pre-listing staging such as professional photography, advice when negotiating a counter offer, and proactive facilitation during the sale negotiations as well as due diligence when finding the right buyer making sure they could qualify. All of these tasks, whether business-related or interpersonal, were accomplished with a noticeable degree of competence, integrity and reliability. We highly recommend John Vizzi for residential real estate needs.